When you’re deciding which video baby monitor to buy, it’s important to determine what you really need it for. Depending on how old your child is, you may want to buy one to watch them play in the other room or just take a nap. But most people want a video baby monitor to keep an eye on them during the night when they are sleeping in the other room. Being able to hear when your child needs you from the other room is important, but being able to see them might be even more important. Sometimes a child could be lying in an awkward position that is dangerous for them. If they don’t make any noise, then you may not even know they are in trouble. That’s where a video baby monitor with night vision comes in handy. Many video baby monitors today come equipped with infrared night vision technology. That just means that you can still see your baby through the monitor even though they are in a dark room. Most of them require a lot of darkness and not much light in order to work properly. The camera itself doesn’t emit a light, so you won’t have to worry about it being a distraction for your baby. The infrared technology allows you to see your baby as clear as day even when it is pitch black in the room. When it comes to your child’s safety, there shouldn’t be anything that’s more important. If you hear your baby crying over the monitor in the other room during the middle of the night, you could get up to check on them, or you could just have a night vision video baby monitor to look at them. Sometimes they are just in need of attention and will fall right back to sleep if they don’t get it after a few minutes. But sometimes there could be something seriously wrong. When you have night vision, you will be able to tell why your baby is crying and act accordingly. 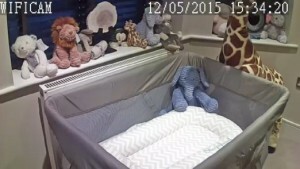 This is one of the most innovative video baby monitors on the market for a variety of reasons. Some of the features include WiFi, night vision, motion and audio detection, and it will even send alerts to your mobile device. For being such a high-tech monitor, people still say that it’s pretty easy to setup and it functions just as easily and reliably. 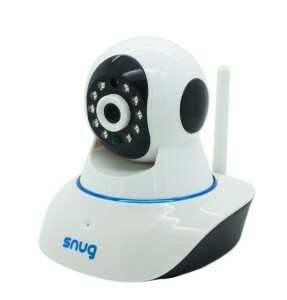 One of the best features that people like about this Snug video baby monitor is the night vision. The camera displays a crystal clear image of your baby whether it’s night or day. About the only difference between the daytime and nighttime images is that the nighttime images are grayscale. Other than that, you can see each object in the room just as clearly as you could in the daytime. This is a huge benefit because you’ll never have to worry or strain your eyes to make sure your child is safe and sound. Night vision is something that all parents need to take into consideration when choosing a video baby monitor. Even if you don’t think you will use it right away, there are going to be certain times where you will wish you had it. Those certain times will definitely be worth having it rather than regretting not getting one with it. Some of them display the night vision better than others, but the Snug video baby monitor is definitely one of the best available. And it’s super convenient since you can download the free app and watch your child right from your mobile device!